Australia and New Zealand, fearing Japanese military resurgence and recognising that Britain could not defend them, forged a new military alliance with the United States. The ANZUS pact was signed in 1951 and was welcomed by the US as a bulwark against communism. 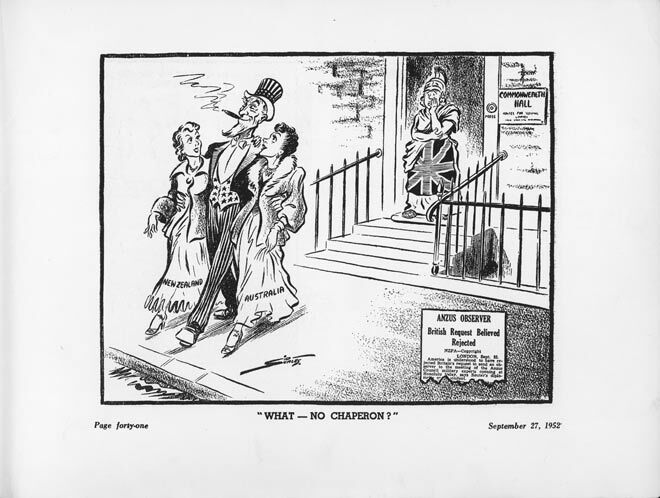 This cartoon satirises the refusal to allow Britain to be an observer at a 1952 ANZUS council meeting, highlighting the weakening of defence ties between Britain and its two Pacific dominions.